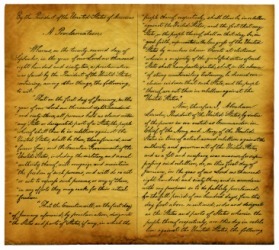 A replica of the Emancipation Proclamation. The definition of the Emancipation Proclamation is an order issued by President Lincoln in 1862 to free the slaves effective January 1, 1863. An example of the Emancipation Proclamation is the order that freed 3.1 million enslaved people when it was issued in the U.S. in 1863. "Emancipation Proclamation." YourDictionary, n.d. Web. 09 April 2019. <https://www.yourdictionary.com/emancipation-proclamation>. Exec-utive order issued by President Abraham Lincoln on January 1, 1863, freeing all slaves held in geographical areas in rebellion against the United States. What Were Abraham Lincoln's Accomplishments?